Bi-folds are the flavour of the month – a few years ago the pages of the trade magazines were dominated by adverts for conservatory roofs, then it was high performance sealed units and now its bi-folding doors. 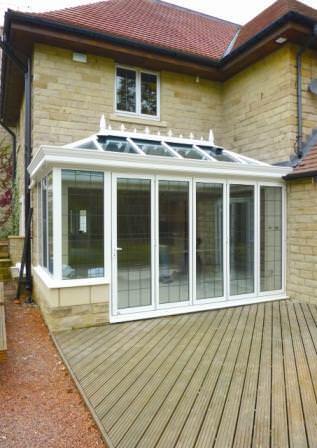 Why are bi-folding doors so in demand in conservatories? Perhaps we should blame Channel Four’s Kevin McCloud and his Grand Designs TV programme! Initially and often shown on TV home makeover shows as a way to add light to dreary rooms, these doors are now increasingly being used on conservatories – with additional structural implications that need to be clearly understood. When these larger than average openings are created in existing masonry walls, concrete or steel lintels are inserted to support the storey above. These lintels prevent the masonry above from crushing the doors below. The same principles need to be applied to conservatories too, with additional support provided as part of the design rather than as a bolt on ‘after the fact’ necessity when things start to deflect and the doors are binding!! When fulfilling the demand for these bigger openings conservatory retailers need to take account of the increased loads that bear onto these longer spans of eaves beam. As a pioneer in the conservatory industry and a dedicated roofing specialist, Ultraframe has taken it upon itself to provide a technically elegant solution to ensure the structural stability of a conservatory which is fitted with this type of door. Ultraframe have created a `beefier’ eaves beam called the Super Duty Eaves Beam for it’s Classic system that sits 38mm taller than its standard product and which allows for door openings which are much wider than normal. The Super Duty Eaves Beam was trialled over many months in the European market and has been available to UK users of the Ultraframe Classic system for a substantial amount of time. The great news for fitters is that the new product is effectively a `big brother’ to the existing eaves beam, and so goes together in the same way and interfaces smoothly with box gutter systems and the Gable Frame Beam. Mark Hanson, Marketing Manager at Ultraframe, commented: “Unlike the gold rush in America in the 1800’s when all and sundry rushed in, retailers must be careful not to try too hard to capture consumer enquiries without understanding all of the issues. Goal-post portal frame arrangements may carry out the required task – and in exceptional circumstances are still required - but they are time consuming to design, costly to manufacture and may require additional skills on site for them to be fitted. The new Super Duty Eaves Beam from Ultraframe addresses the need for additional structural support in the majority of instances in a way that is both cost effective and simple for fitting teams”. The Super Duty Eaves Beam is available on Classic roofs purchased either through local Fabricators/Distributors or on roofs built at Ultraframe`s own factory. A 12-page technical specification guide is available to assist retailers in the correct design and specification of these larger openings. To make life easier for those who are new to folding/sliding doors or those who are seeking a one stop shop, the company can also provide aluminium bi-folds . The doors are available in a variety of panel configurations (2, 3, 4, 5 and 6) and widths and come in white as standard, although other RAL colours are available. Doors are glazed with a 28mm sealed unit and feature a centre pane ‘U’ value of 1.2.The engineering performance of the Super Duty Eaves Beam is optimised for use with high quality aluminium bi-folds, of the type supplied by Ultraframe. The span charts in the technical guide are based on a maximum deflection of 7mm under full structural load, and the doors supplied by Ultraframe can accommodate this degree of deflection without catching. Some bi-folds being offered are not designed for conservatory use, but to sit inside lintel supported masonry where deflections are minimal – in these situations, you should check with the door system company.